◆ Detachable Magnetic shock absorption back. ◆ Front Side can be flipped over your cellphone screen and folded to create a stand for your cellphone. ◆ Fully adjustable for hands-free video calls, reading, or movies anywhere; Comfortably carry cards plus bills. ◆ Protects your mobile phone from dust, dirt, scratches & damages. ◆ Perfect combination of purse and mobile phone case. ◆ Smart Design allows you to grab cards and money easily and conveniently. ♥ For your convenience, please search "elecfan + product name"to take the fastest way to buy other products you want and have a clear view of other products we offer in store. 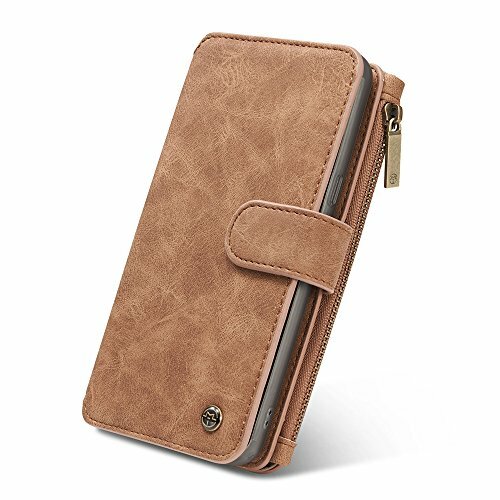 ◆ Unique designed mobile phone case for Samsung Galaxy S8 Plus 6.2 inch Phone only,please confirm your phone model before purchase it. ◆ Precision cut-outs for all ports, access to all controls and functions without removing the case. ◆ Screen Protector: provides complete all-around protection for your phone, including the display. ◆ Outer magnetic flap closure and smart inner button closure to keep credit cards and cash safe.And the front flap of the leather case protects the display and prevents fractures in a case. ◆ Detachable Magnetic Design: you can carry the phone case with your wallet or you can take it out of the wallet if you just want to carry the phone without the purse.